"Paws of Gotham” is Louie’s Legacy's fourth annual calendar aimed at raising funds to rehabilitate and re-home animals from high-kill shelters across the United States. "Paws of Gotham” was shot by famed South African photographer Candy Kennedy. The images she captured focus on the diversity of both people and pets, and showcase the noise and colorful energy of New York City. Each month features a stunning photo of a real rescue pet, most from Louie's Legacy, with a celebrity, influencer or model, and is shot in front of an iconic New York scene. Candy Kennedy, along with celebrities, influencers, activists and models such as Mario Cantone, Maggie Geha, KhrystyAna, Brett David and Chef Rōze Traore, just to name a few, have all donated their time and efforts in hopes to raise funds for Louie’s Legacy's important cause. “This project has given me the opportunity to combine my love for animal charities and New York," says Kennedy. “Not only was I able to work with some amazing and creative people on this calendar, but they all share the same love for animals, which makes this project very rewarding and special. I am very proud of how hard everyone worked to find the perfect locations, people to shoot, and most importantly, to fit the right pet with the right person. There is nothing better than the feeling of helping an animal or person in need." Pre-orders start Monday, Oct 9th and can be made by going to http://www.louieslegacy.org/wp/calendar. Louie’s Legacy Animal Rescue, Inc., is a non-profit, grassroots all-breed animal rescue, which saves, rehabilitates and re-homes animals from high-kill shelters across the United States. Louie's Legacy operates in Cincinnati, OH and Staten Island, NY. Since 2009, Louie's Legacy has saved over 10,000 animals. Recently, during the hurricane season of 2017, LLAR rescued more than 200 animals who were in shelters in Texas and Florida prior to Hurricane Harvey and Irma, taking on over $10,000 in additional non-routine medical expenses in addition to the cost of the rescue mission. Louie's Legacy Animal Rescue is proudly foster based, meaning their animals live in homes, not shelters. This differentiates them and allows them to more thoroughly get to know the animals, ensuring they are matched with suitable, screened adoptive homes, which meet their high standards. As part of their commitment to the health and wellbeing of all of the animals and to reduce pet overpopulation within the community, every pet is spayed or neutered prior to adoption. They are committed to ensuring the safety of their animals for their entire lifetimes so that they will never suffer abuse, neglect or abandonment again. For more information, please visit http://www.louieslegacy.org and follow them on Twitter and Facebook @louieslegacy and @LouiesLegacy on Instagram at louieslegacy. Candy Kennedy is a South African born, New York based Commercial Advertising Photographer and Director that brings edge and excitement into traditional brands. Candy is a collector of moments and her images are both intimate and edgy. With a natural ability to relate to her subjects, the images she captures are known for being alive and packed with expression and emotion. She prides herself on seizing real moments with the ordinary, famous and bizarre, and turning them into beautiful photographs. Her passion, strong work ethic and professionalism have afforded her the opportunity to work with brands such as Virgin Mobile, Adidas, Nike, Vogue, GQ, Wrangler and Macy’s just to name a few. To learn more about Candy, please visit Candykennedy.com or TheKennedys.NYC and follow her on Instagram @CandyKennedy or Facebook @candykennedyphotographer. Entrepreneur Brett David photographed with a rescue dog for Louie’s Legacy's 2018 Annual Fundraising Calendar "Paws of Gotham” to raise funds for animal rescue.Louie’s Legacy Animal Rescue, Inc., is a non-profit, grassroots all-breed animal rescue, which saves, rehabilitates and re-homes animals from high-kill shelters across the United States. Actor Mario Cantone photographed with a rescue dog for Louie’s Legacy's 2018 Annual Fundraising Calendar "Paws of Gotham” to raise funds for animal rescue.Louie’s Legacy Animal Rescue, Inc., is a non-profit, grassroots all-breed animal rescue, which saves, rehabilitates and re-homes animals from high-kill shelters across the United States. Body Positive Activist KhrystyAna photographed with a rescue dog for Louie’s Legacy's 2018 Annual Fundraising Calendar "Paws of Gotham” to raise funds for animal rescue.Louie’s Legacy Animal Rescue, Inc., is a non-profit, grassroots all-breed animal rescue, which saves, rehabilitates and re-homes animals from high-kill shelters across the United States. 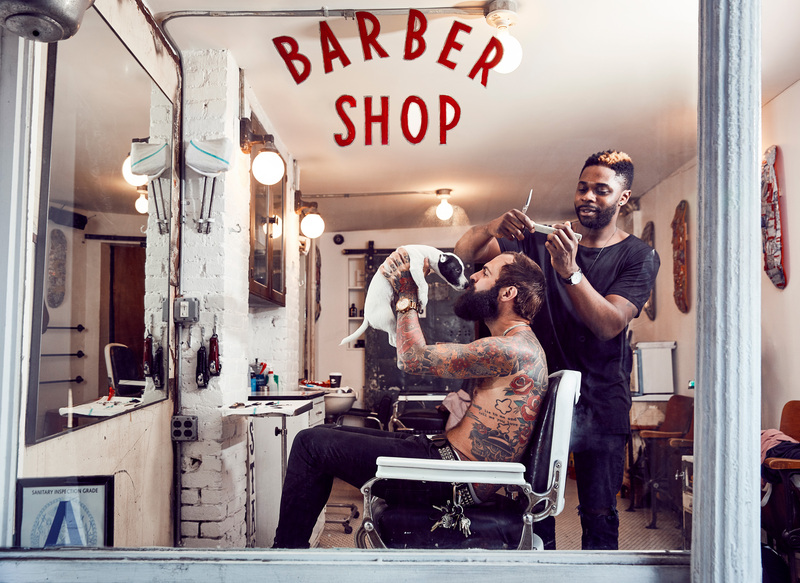 Chef Rōze Traore photographed with a rescue dog for Louie’s Legacy's 2018 Annual Fundraising Calendar "Paws of Gotham” to raise funds for animal rescue.Louie’s Legacy Animal Rescue, Inc., is a non-profit, grassroots all-breed animal rescue, which saves, rehabilitates and re-homes animals from high-kill shelters across the United States.